coincided with the 50th anniversary of Lawrence’s death. It aims to offer a forum where friends can come together to share their enthusiasm for a man who has greatly enriched their lives in many ways, reflecting the diversity of Lawrence’s own interests. There are currently around 600 members, of whom two-thirds live in the UK. Overseas members come from countries throughout the world, including a large contingent from the USA. The Society issues two 80-page Journals and three Newsletters each year. The Newsletters report on current events of interest to members, including the activities of the Society. The Journal, whose accumulated issues now form an invaluable biographical source, contains research articles and reprints of significant material about Lawrence. Content is chosen to reflect many different aspects of Lawrence’s life. Subscription income is spent as far as possible on publications. The most important gathering organised by the Society in the UK is the Symposium, held every two years. Past speakers have included such eminent names as Jeremy Wilson, Malcolm Brown, Professor John E. Mack, Professor John Adair and Dr Philip O’Brien. The most recent Symposium was held at St John’s College, Oxford, in September 2016. Coinciding with the centenary of the outbreak of the Arab Revolt, a special programme of events was organised to mark the occasion. The Society maintains a research collection which is kept at Wareham Library in Dorset. It can be consulted by arrangement with the library by any member of the public. 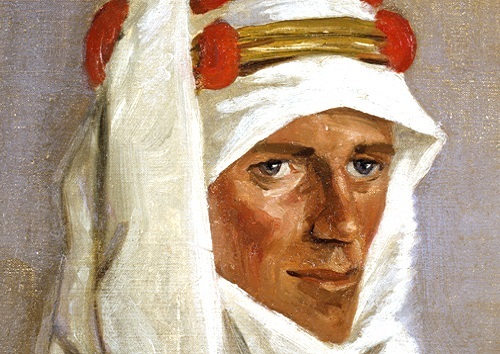 The Society is the publisher of a unique and scholarly work, T. E. Lawrence: A Brief Chronology, compiled by a former chairman, the late Ronald Knight, which lists Lawrence’s activities throughout his life on an almost daily basis. Members also produced Lawrence and the Arab Revolt, an exciting digital recreation of a 1920s lantern slide show, using photographic images from our own collection held at the Tank Museum in Bovington. General Meeting, normally held in the autumn. In Symposium years, the AGM is held at the end of the Symposium sessions. 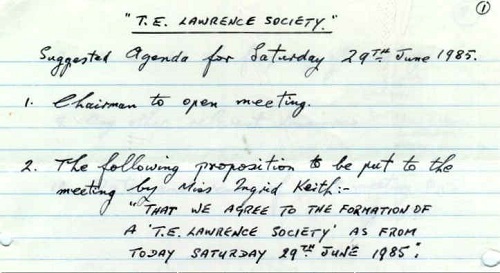 In alternate years, the Society tries to offer a programme of Lawrence-related events around the chosen venue. possible. Anyone wishing to claim credit for a photo where it has been omitted should contact us and we will happily make reparations!